Now smart home tech is becoming easier-to-use, more efficient and even smarter, it's the perfect time to pick up a few of the best devices to give yourself peace of mind and secure your home. Once upon a time, installing a new home security system was a costly and complicated process. But fast-forward to the present day and there are now all kinds of internet protocol security cameras that can be found for affordable prices at nearly every budget. The best news is that, once installed, they can be easily accessed and monitored using a smartphone, tablet or laptop. We want to help you discover the best possible standalone home security camera, or all-singing, all-dancing home security system, at a great price. That's why we've rounded up all of the best cheap home security camera deals we could find. That means whether you're looking for an indoor camera to keep an eye on your pets or your kids, or a system of outdoor cameras to monitor all of the entrances into your home, there are deals available at every price point. Below you will find a detailed selection of some of our favorite cameras, as well as a list of other fantastic deals. The Netgear Arlo Pro 2 is called "pro" for a reason. This high-end set-up is truly a professional-quality security system for your property. The Arlo Pro 2 comes as a starter pack consisting of one hub and two cameras. The cameras are of a high-end and solid build and they're capable of recording crystal-clear 1080p HD video. It's worth noting that they do work well both indoors and outdoors, thanks to their IP65 waterproof rating and strong magnetic mounts. Thanks to 8x digital zoom, a 'smart siren' and a powerful Night Vision mode, there's no corner of your home you can't keep a close eye on from the system's app or web interface, giving you ultimate peace of mind. The only downside is that the set-up can be tricky and it's not the most intuitive security system on the market either. The Hive View is the latest camera from the smart home manufacturer behind the well-regarded range of heating control kits. A collaboration with designer Yves Béhar, the Hive View is one of the few security cameras we’ve ever seen that actually looks stylish, coming as it does in a choice of champagne gold or black and brushed copper finishes. Unlike most other security systems, the Arlo Go from Netgear has an interesting proposition: it's totally wireless. It works using a 4G LTE signal rather than WiFi, which means it works whenever it has mobile coverage. Add to that its IP65-certified waterproof rating and you've got yourself a portable camera that really can go anywhere. Well, anywhere with mobile signal. Installation is easy peasy, just pop in a SIM card, sync it up with the Arlo App on your phone and you're ready to go. You can place it anywhere and if you're putting it outside you can screw it to a metal stand. Although we worry this could put it at risk of being stolen, that's irony for you. The Arlo Go records HD at 720p. Although this is lower than other cameras in our buying guide, many of us don't really need best-in-class 4K recording on a security camera - especially if you're trying to transmit that kind of data via 4G. It also has a bunch of solid recording features, including motion sensing, timing options and geo-fencing, which turns the camera off when you're on your way home. The main downside is that it won't get perfect 4G coverage everywhere, especially in the countryside where good 3G is sometimes hard to come by. And if it doesn't have it, it just stops working as there's no option to use a mobile hotspot or to connect to Wi-Fi as a back-up. The main drawback with the Nest Cam IQ is that to use its full range of functions you’ll have to purchase a subscription to Nest Aware. But if you want the best quality, the Nest Cam IQ is probably the camera for you, especially if you find a deal. The Netatmo Presence is a definite statement of a security camera. Its hefty black body feels significant to hold, and is difficult to miss. This is both a strength and a weakness, as aesthetically it’s probably not going to complement your house design, but it does mean it’s a strong deterrent for anyone thinking about breaking in. Adding to the deterrence factor is the powerful dimmable LED floodlight, which you can adjust to your specified brightness. The Presence itself is an all-metal unit waterproofed to IPX7 standard, so you don’t have to worry about it being outdoors in a storm. The Nest Cam Outdoor is, unsurprisingly, the outdoor camera from Nest. Much like its indoor counterpart, the Outdoor boasts brilliant image quality and a fantastic app, which is no surprise given Nest’s origins as a Google company, now existing as part of Google’s parent company, Alphabet. The Nest Cam Outdoor requires a subscription in order to unlock the full suite of features, but that’s fairly common with security cameras. 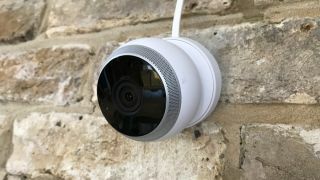 The one fault we have to pick with the Nest Cam Outdoor is that it connects to its base with a magnet, meaning a thief could feasibly pluck it from the base, and, er, steal it. Nest is obviously aware of this flaw, as there is an upgrade in the shape of the Nest Cam IQ Outdoor, which has the smarts of the Nest Cam IQ (above), but is "tamper-proof." Monitor and secure your home with the Ring Security Cam that features built-in motion-activated floodlights. The Ring Floodlight Cam replaces your existing floodlights and requires hardwired installation. You'll be able to monitor your property in HD video and get alerts when motion is detected with the compatible Ring app. You can even activate the siren from your phone or tablet when you see anything suspicious. You'll also be able to hear and speak with people from your mobile device through the camera's built-in microphone and speaker. The Ring Cam allows you to customize your motion zones so you can focus on areas of your property that are most important to you. The Floodlight Cam has advanced motion sensors and a 140-degree field-of-view so you can monitor your blind spots. The Ring camera also features night vision and works with Alexa to launch on-demand video at the command of your voice.